Tron faces the death knell of his lingering injuries. This episode was the first season finale of Tron: Uprising and, as it turned out, the final episode of the series. In this episode, Cutler (previously seen in "The Renegade" Parts 1 and 2), returns, having been repurposed by Clu as one of his leaders, in command of the giant recognizer Dyson built in "The Stranger". 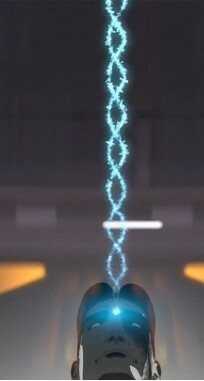 As Tron's repurposing commences and his code extraction begins, notice that the code is seen in the form of a double helix, similar to organic DNA. 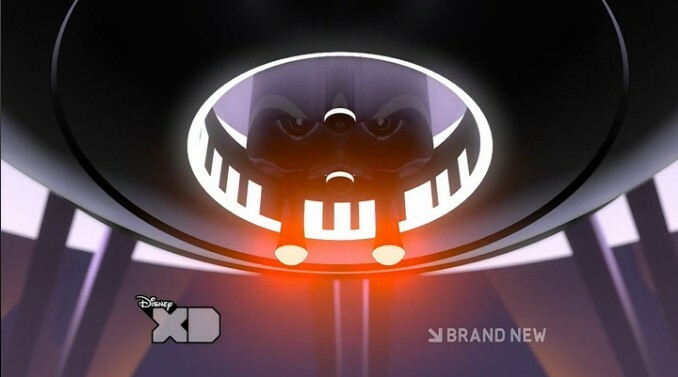 At 14:55 in the episode, the repurposing emitter looks eerily like the upper half of Darth Vader's mask! Hopper and Bartik are seen among the crowd of programs who stand up to Pavel and the guards. Clu's ship, seen at the end of the episode, is the same model as the one he uses in Legacy, but has yellow highlighting instead of orange. Tron is seemingly fully-healed from the beating he took from Clu in Evolution by the end of this final episode. So, how/when did he wind up repurposed as Renzler in Legacy?